Position switches are the connection element between machine and control. Moeller is one of the world-wide pioneers in the area of position switches. The new position switches are quickly installed, highly flexible and safe. The right product is available for every application: In the robust metal enclosure (LSM) for harsh applications or in the totally insulated plastic version (LS) without earthing requirement. The new "LS-Titan®" position switch offers a maximum in modularity and flexibility: Two full device ranges, each provided with a plastic or metal enclosure are available to the customer. 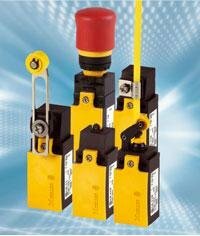 All devices are actuated mechanically and are particularly suitable for use in safety-relevant circuits intended for protection of personnel and machines. The coloured marking of the enclosure and operating heads in the "yellow" signalling colour make it unmistakably clear that you are dealing with a safety component. “LS-Titan®” conforms with category 3 of the Machine directive EN 954-1. The mechanically made contacts act positively: All break contacts have a positive opening function conform to IEC/EN 60947-5-1. Thus, they can be used in circuits intended for safety purposes. Control circuit devices from the RMQ-Titan® range can be combined with the LS-Titan® switches – an innovation: Pushbuttons, mushroom actuators, selector switches, keyswitch actuators and emergency-stop actuators can be snapped onto every position switch as operating heads. 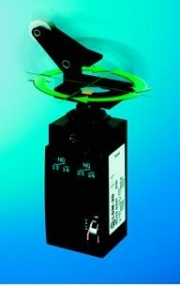 The operating heads can be fitted in all four directions (4 x 90°) and quickly and easily installed with a bayonet catch. The fuly insulated plastic housing conforms to protection class II. Thus, they are simple to install and do not require a protective earth terminal. This saves wiring time and precious tooling time.